Garbharakshambigai Temple is a Lord Shiva temple located in Thirukarugavur, 6 km from Papanasam and 20 km from Kumbakonam. Moolavar is Lord Siva, known here as Mullaivananathar. The temple is famous for mother Karpa Ratchambikai or Garbarakshambigai Amman( one who protects the child in the womb). The temple has a 5-tier Rajagopuram and an outer prakaram(circumbulatory path). There are inscriptions from Cholas and king Koparakesarivarman. 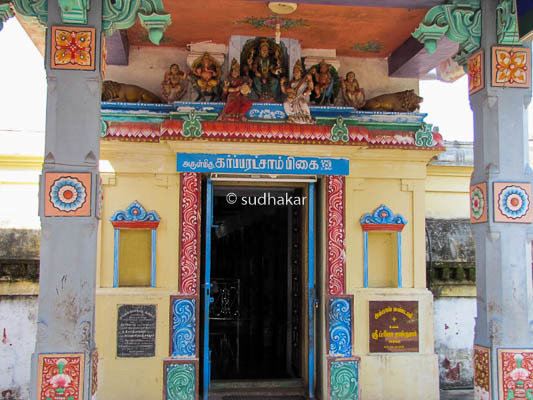 The sannidhi (sanctum) of Mullaivananathar is in the second praharam and the sannidhi of Amman is located near to the Mullaivananathar sannidhi. There are separate sannidhis for Natarajar, Somaskandar, Karpaga Vinayagar and Navagrahas,Dakshinamurthy,Arthanaariswarar,Subramanya,Brahma,Durga. There are separate shrines for saiva saints Sezhkizhar,and others.The sthala vriksham (holy tree), Mullai tree is located in between the Swami shrine and Chandikeswarar shrine. 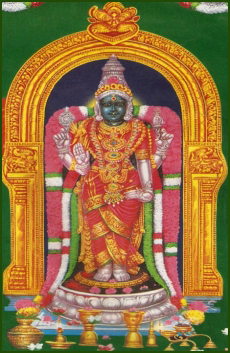 Sri Mullaivananathar Swamy is worshiped for health. The Swamy here is swayambhu (self manifested).This swayambu lingam is of hardened termite mound and hence there is no Abhishegam for this swami. Punugu sattam ( a fragrant incense from Asian Civet cat) is being offered on the Valarpirai Pradosham day, the 13th day after amavasai (new moon). This Punugu is believed to have healing power and it is sent as prasadam for people who suffer from incurable skin diseases. 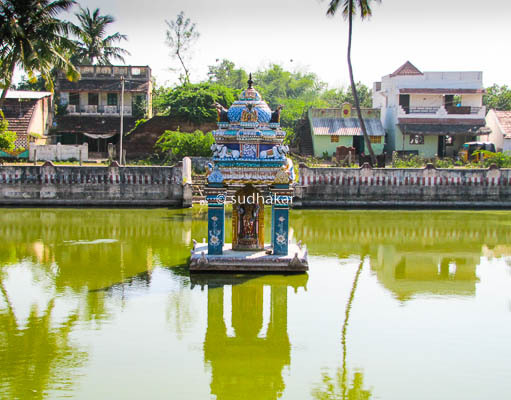 Sheerakundam, also called as Parkulam is the temple tank located opposite to the temple and the water is believed to be born out of the milk of the sacred cow Kamadenu and hence called Parkulam. Beleifs and Rituals Manyy of the devotees praying to Garbaratchambikai are women longing for a child after years of marriage. Many others pray for safe delivery. Women unable to conceive a child even after many years of marriage are offered a ghee as prasad dedicated to the Garbaratchambikai Amman ,Karukatha Nayaki. The couple have to consume it for 48 nights continuously. Even if the husband can not do so, the wife should follow consuming the ghee. No diet restrictions are stipulated. It is staunchly beleived and proven that the woman will conceive within a few months. The temple offers castor oil for the pregnant women which they have to apply on their stomach during labour pain for safe and normal delivery of the child. The following poojas are performed in this temple. 8)	Ear boring and Head tonsure. Festivals Vaikasi Visagam for Swami Mullaivananathar, Adipooram and Navarathri uthsavams for Ambal are important festivals. How to reach? 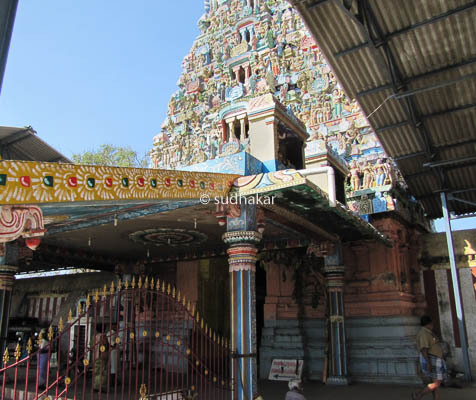 The temple is located at 22 Kms from Kumbakonam. Plenty of local buses,cabs and auto rickshaws are available from Kumbakonam. Places nearby Kumbakonam is a place with many famous temples and Oppiliappan temple, Patteeswaram Durgai, Darsuram, Thirubhuvanam,Swamimalai are very nearby. Contact The Executive officer, Sri Mullaivananatharswamy and Garbarakshambigai Amman temple, Thirukarukavur, Papanasam Taluk, Thanjavur District. Pin code: 614 302.